Our study, recently published in the journal Nature Climate Change, shows the first evidence that summer downpours in the UK could become heavier with climate change. We used a very high-resolution model more typically used for weather forecasting to study changes in hourly rainfall. Unlike current climate models, this has a fine resolution and is able to realistically represent hourly rainfall, so this allows us to make these future projections with some confidence. 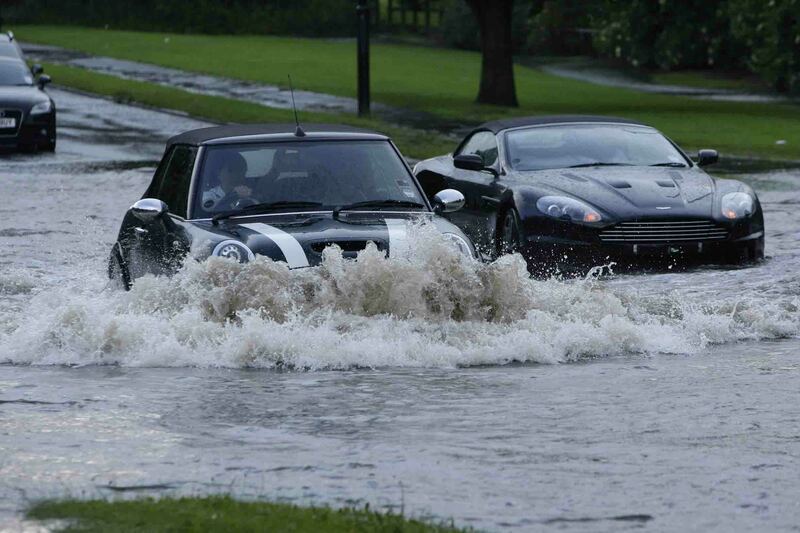 Cars in flood on the Great North Road, Newcastle upon Tyne. 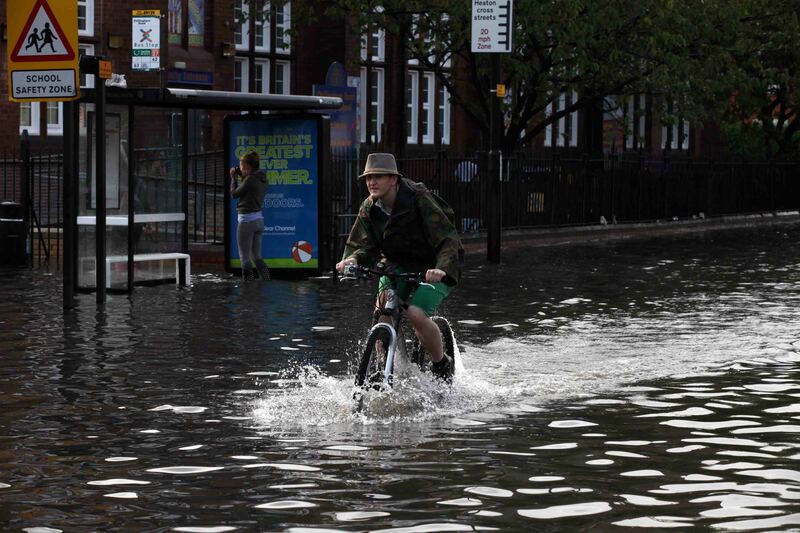 Photo from the 28th June 2012 “Toon Monsoon” event in Newcastle upon Tyne, UK, where there was almost 50mm rainfall in 90 mins. ncjMedia Ltd – John Millard. What we found was that summers are likely to become drier overall by 2100, in a warming climate. But our results suggest that when it does rain, it will be heavier in short outbreaks. In particular, intense rainfall with the potential to cause serious flash flooding (more than 30mm in an hour) could become a more common occurrence, increasing in frequency by several times. This is, of course, of great significance for the SINATRA project. Climate models generally work at coarse resolutions, using grids of around 12km square or larger, and have been able to accurately simulate winter rainfall from sustained, long-lasting periods of rain from large-scale weather systems. These models point toward wetter winters, with the potential for greater daily rainfall in the future. But summer weather is harder to predict using such coarse models. In summer rainfall tends to come in short but intense bursts, such as during the “Toon Monsoon” in Newcastle on 28th June 2012, so it is changes on an hourly basis that are important. So far climate models have lacked the resolution to accurately simulate the smaller-scale convective storms (intense showers formed by rising air) which cause this type of rain. However, we use a 1.5km square grid model (the same as the UK Met Office Weather Forecast model); this is the most detailed model ever used in long climate simulations to examine rainfall change, leading to much higher accuracy. We ran this model to simulate two 13-year periods, one based on the current climate and one based on the climate at the end of the century under a high-emissions scenario (the IPCC’s RCP8.5 scenario). The simulations were so computationally intensive that it took the Met Office’s supercomputer – one of the world’s most powerful – about nine months to run the simulations, and even then we could only run the model for the southern half of the UK, about as far north as Manchester. For winter, our model showed increases in hourly rainfall intensity consistent with previous studies. However the finely grained model also revealed that short-duration rain will become more intense during summer, something that coarser models are unable to simulate. This finding is of major importance due to the potential for flooding: a threshold of 30mm per hour is used by the Met Office and Environment Agency Flood Forecasting Centre as guidance to indicate likely flash flooding, and our results suggest this may be exceeded more often (up to five times) and over a wider area in the future. Cyclist on Chillingham Road in Heaton, Newcastle upon Tyne. Photo from the 28th June 2012 “Toon Monsoon” event in Newcastle upon Tyne, UK, where there was almost 50mm rainfall in 90 mins. ncjMedia Ltd – Lewis Arnold. Our findings are only the results of one climate model and we need to wait for other centres to run similarly detailed simulations to see whether their results support these findings. However, an increase in summer storms in a warmer, moister environment is consistent with theoretical expectations, and with the limited observational studies we have of hourly rainfall to date. This work is part of the joint Met Office and NERC-funded CONVEX project. The next steps are to see if the results are consistent with observations and predictions of hourly rainfall from climate models in other parts of the world, to be undertaken by the European Research Council-funded INTENSE project jointly run by Newcastle University academics in collaboration with the UK Met Office and other leading international scientists. And to use these results within the SINATRA hydrodynamic and hydrological models to examine the potential effects on flash floods. We acknowledge funding from the Joint DECC/Defra Met Office Hadley Centre programme (GA01101) and the NERC funded project CONVEX (NE/1006680/1). This entry was posted in Uncategorized on June 4, 2014 by Rob Thompson.